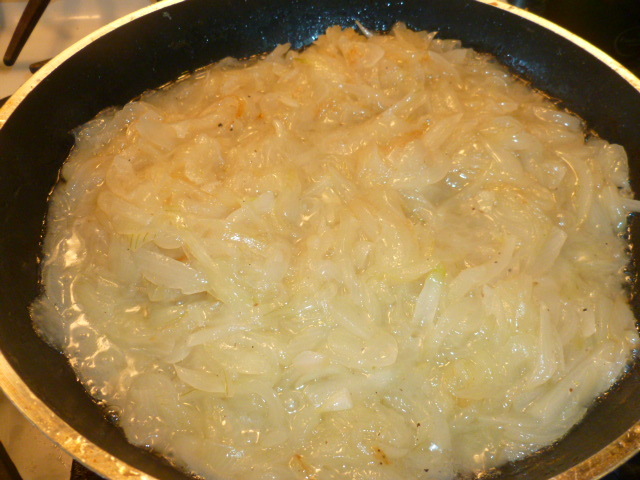 Once again, I go back to one of my favorite ingredients, caramelized onions. It is always fascinating to see how one simple ingredient can turn into such a tasty food only by cooking it slowly and patiently. 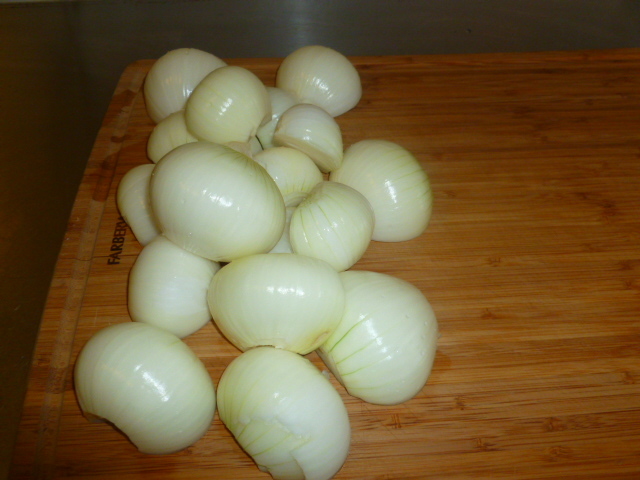 This time, I’ve decided to make an onion tart with it. Unlike with most onion tart recipes I’ve come across, here I didn’t add any cheese/cream/eggs/bacon to the caramelized onions, as I wanted to keep their flavor as is. 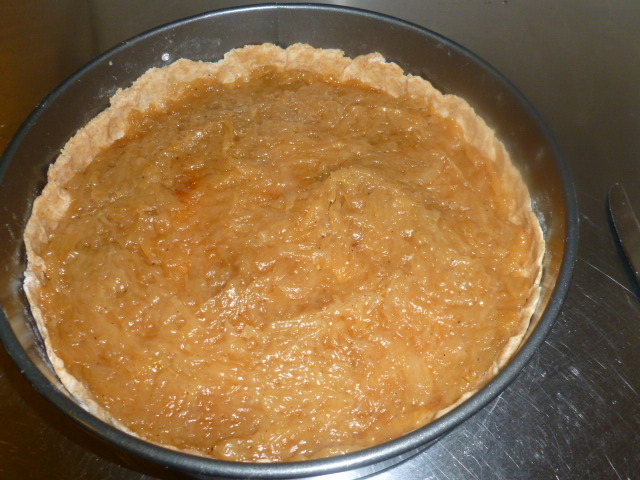 An extra bonus with an onion layer that doesn’t contain liquids, is that there is no need to pre-bake the dough. 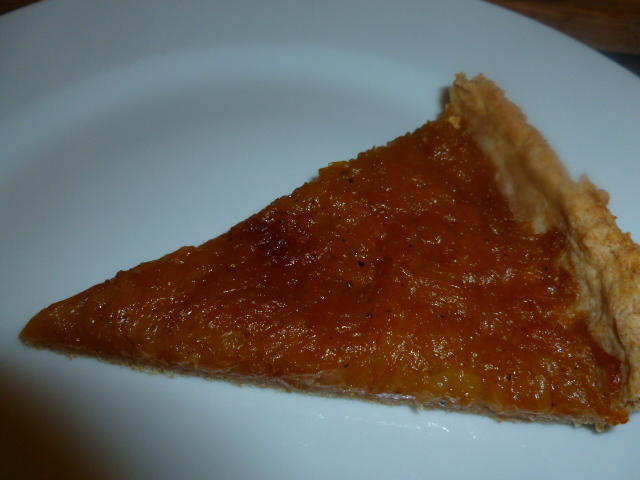 The result is a thin flaky layer of crust, with a tasty jam-like onion layer. 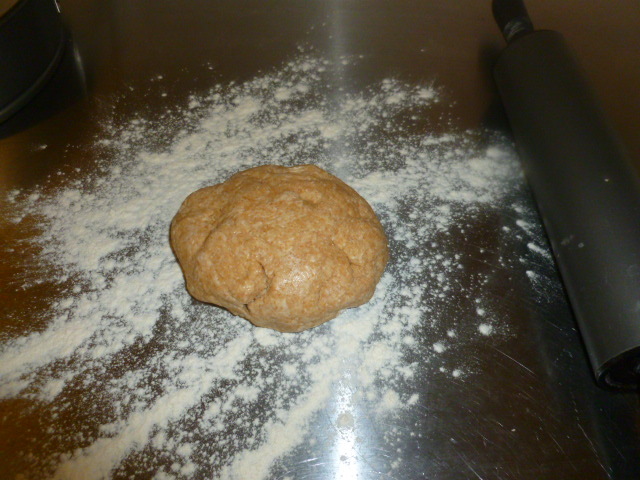 In the dough, I chose to mix white flour with spelt flour, which adds a slight nutty flavor and deep color to it. If you can’t get spelt flour, you can substitute it with sifted whole wheat flour, or omit it altogether and use only white flour. A side salad as shown here, of mixed greens with Balsamic vinaigrette, goat cheese and roasted hazelnuts, round it all up to beautiful and tasty dish. 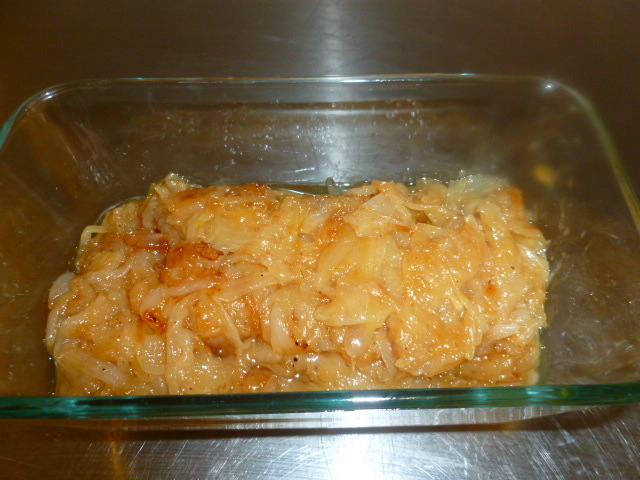 For more recipes with caramelized onions, check out THIS and THIS posts. 1. 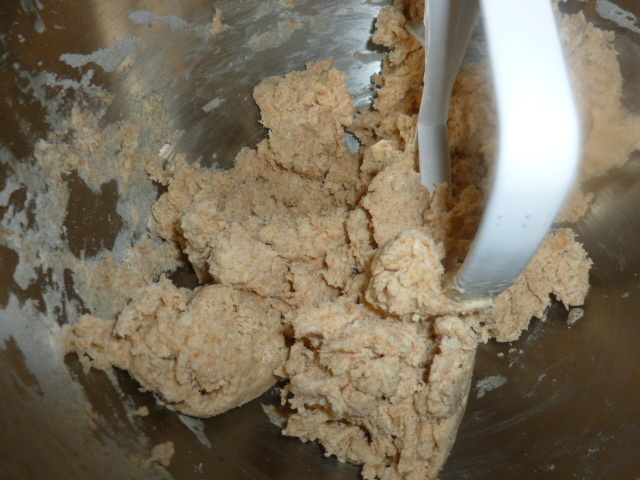 The dough: mix the flours, butter and salt in a mixer bowl. 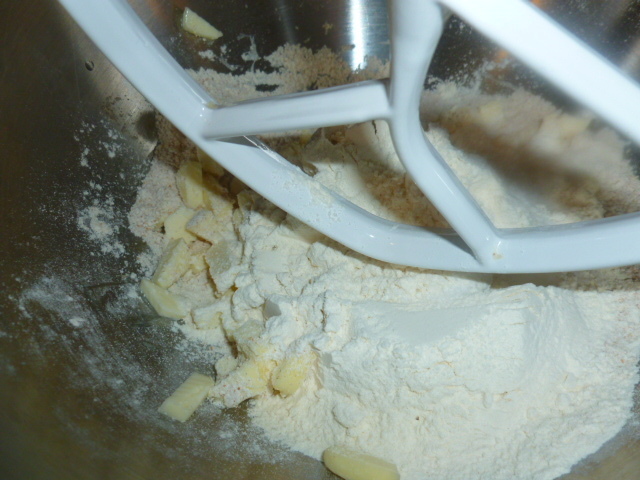 Mix with the mixing hook to a crumbly mixture. Add 1Tbs ice water at a time, until a dough is formed. Do not over mix. Transfer to a work surface, shape into a ball and cover with plastic wrap. Chill in the fridge for an hour. 2. 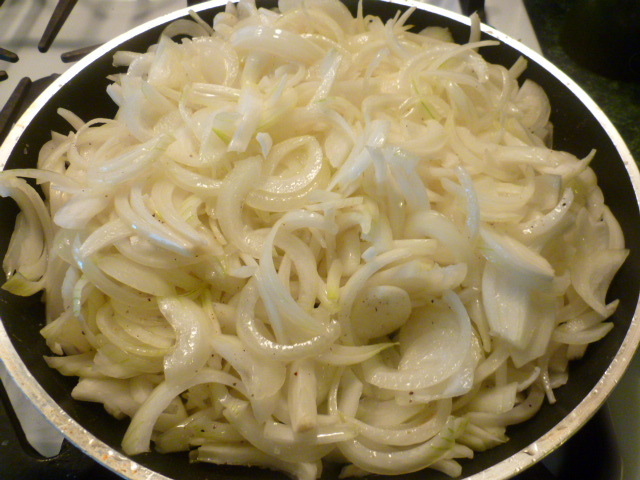 The onions: peel the onions and cut them in half, lengthwise. 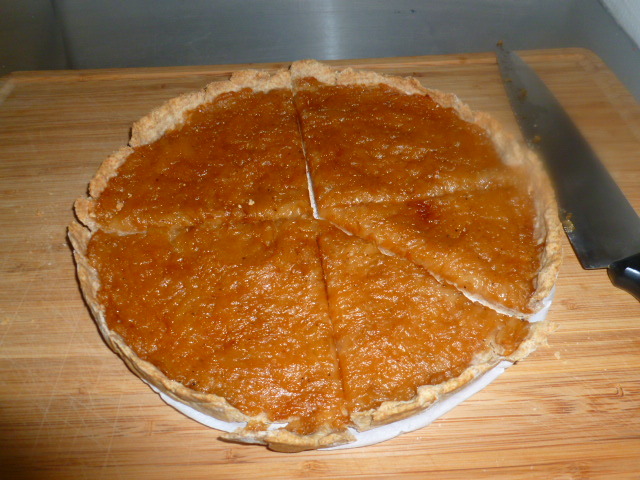 Slice to medium thickness with a sharp knife or in a food processor. Pour the oil into a wide pan. Add the onions, the salt, sugar and black pepper. 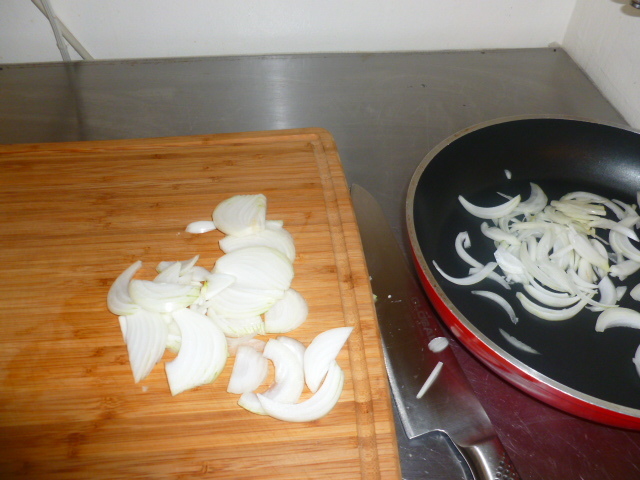 Mix gently and sauté on medium-low heat, mixing occasionally, for 10 minutes, until the onions soften. Lower the heat to low and keep cooking, gently mixing occasionally, until the onions get a deep amber color, about 20-25 minutes longer. 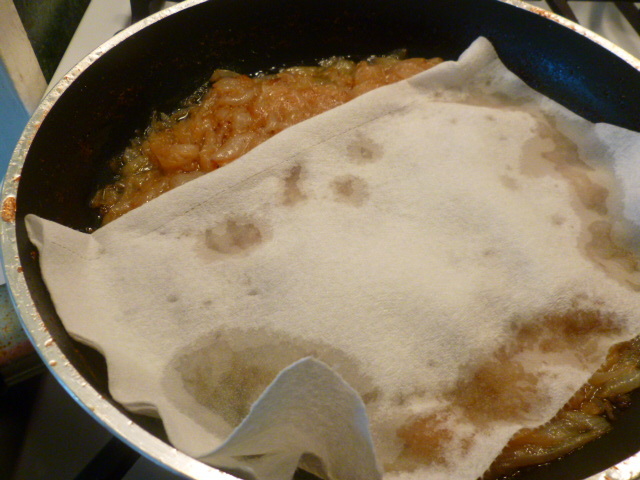 Let cool for 2-3 minutes and place a paper towel on top, to absorb extra oil. Taste and adjust seasoning if needed. Let cool to room temperature. 3. Preheat the oven to 350F (175C). 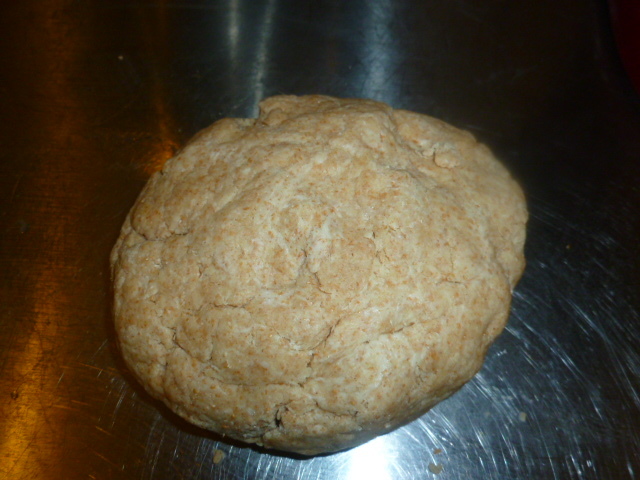 Roll the dough on a floured surface to a round sheet ¼” (½ cm) thick. 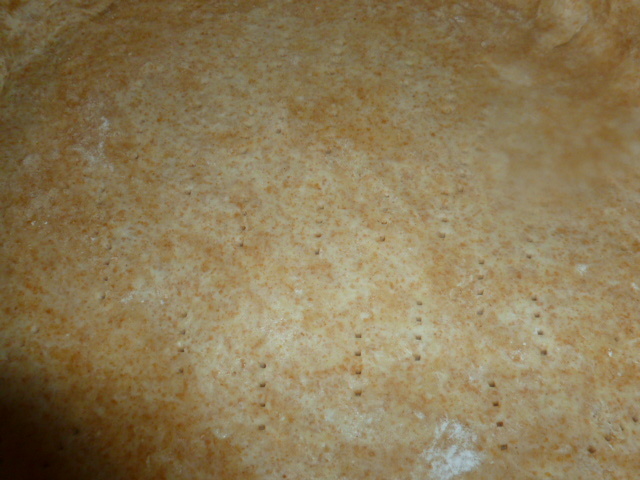 Cover the bottom of a 10” (26cm) spring pan with baking paper. 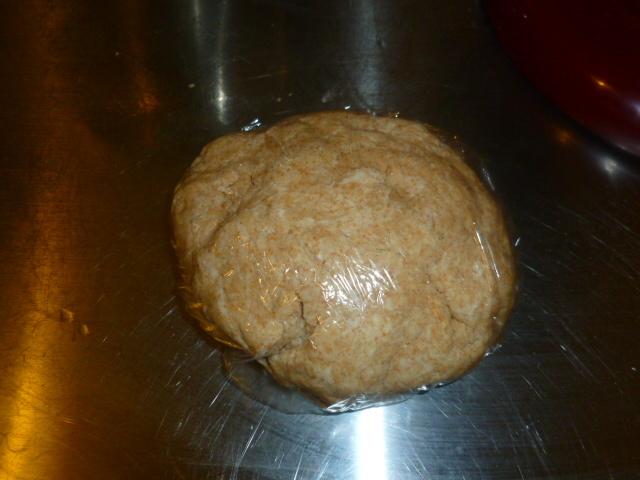 Place the rolled dough on top. 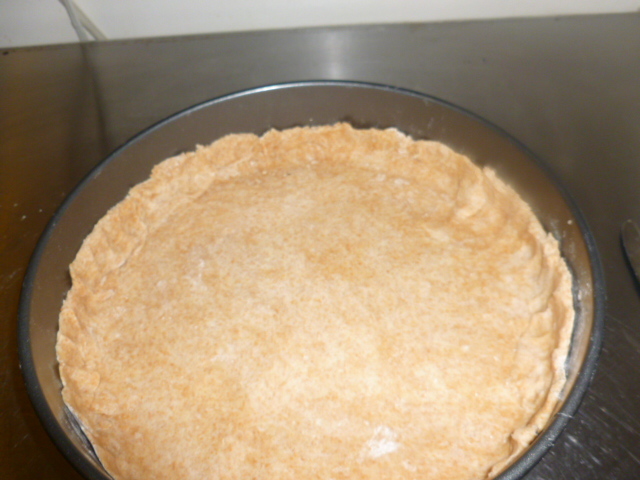 Trim the edges and press them with your fingers to the rim of the pan. Prick with a fork and spread the caramelized onions on top. 4. Bake for 55 minutes. Release from the pan and transfer to a large cutting board. Let cool for 10 minutes. 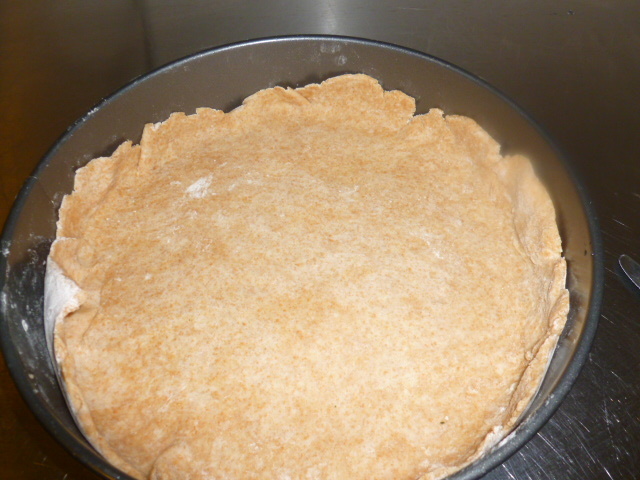 Gently remove the pan bottom and baking paper and cut the tart with a large sharp knife into 8 portions. This onion tart looks delicious! Perfect for brunch :D Thanks for sharing! 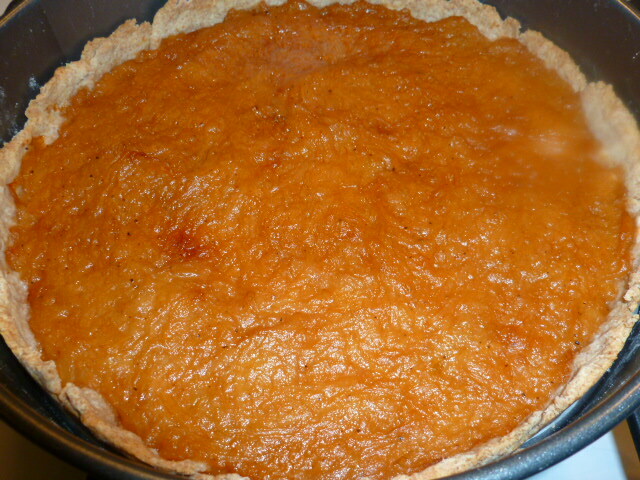 The tart looks very inviting – a lovely color. 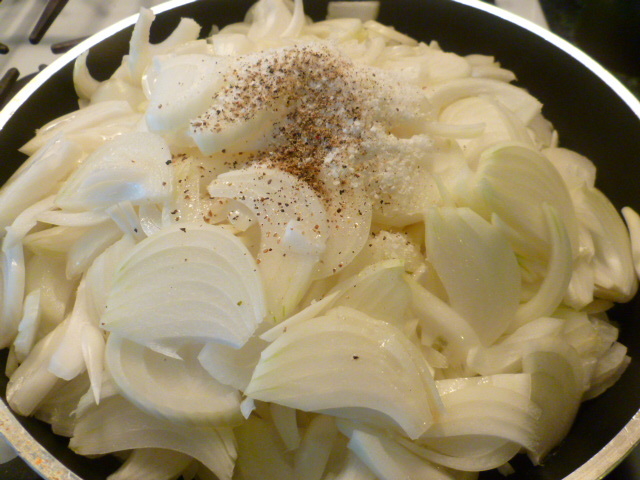 When I slow cook onions, I do a bunch at one time and keep them in the refrigerator for incorporation, ad hoc, into whatever strikes my fancy. You’d be surprised how many uses there are. If you don’t have time to tend them fairly assiduously, an easy way to do this is to plop them into a Crock-Pot. 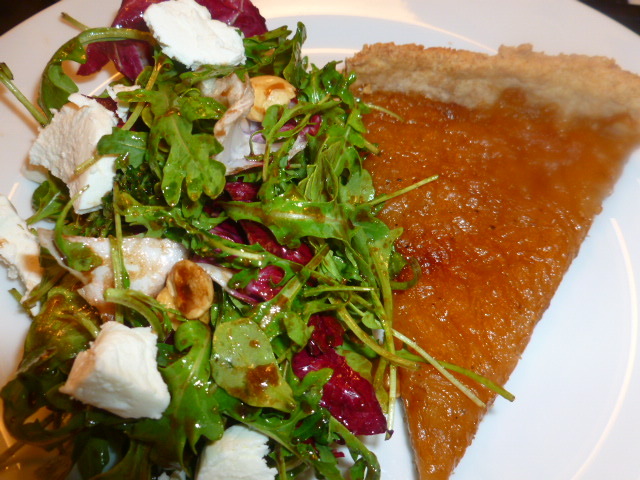 Such a lovely looking duo:) The tart sounds simply scrumptious! 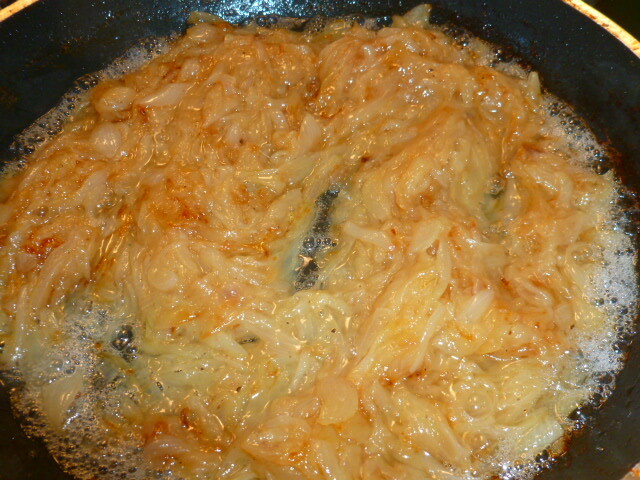 How is it possible to do not love caramelized onion??? I love your tart! My goodness. Look at that carmelization going on! I didn’t realize that some (crazy?) people don’t like caramelized onions! 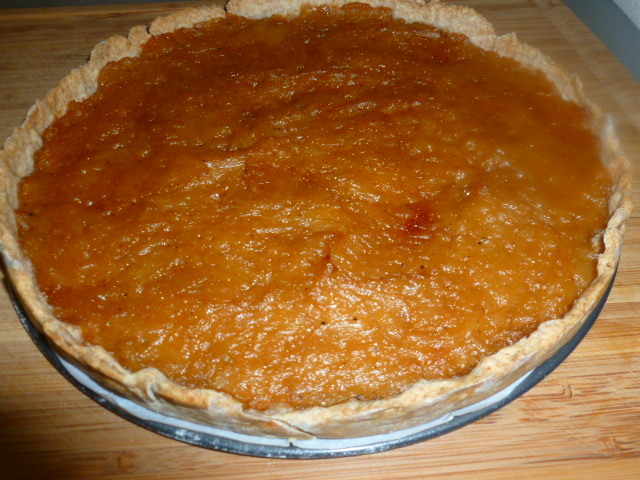 A great looking tart – I imagine this tart is really full of all the wonderful caramelized onion flavor! Oh wow! What’s not to like?? I make several different versions of an onion tart and yours is very different. I can’t wait to give it a try. I do too, and this is different indeed and has an intense caramelized onion flavor. Wow, Renit! 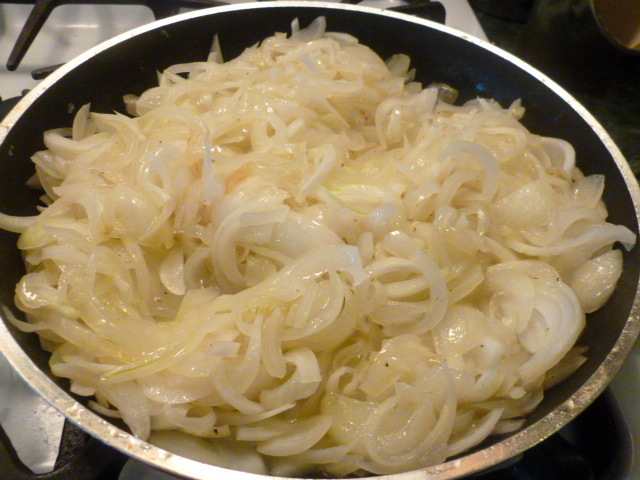 I’m a big fan of caramelized onions and using them here, without any cheese base, would really let them shine. This sounds wonderful. This looks delicious! 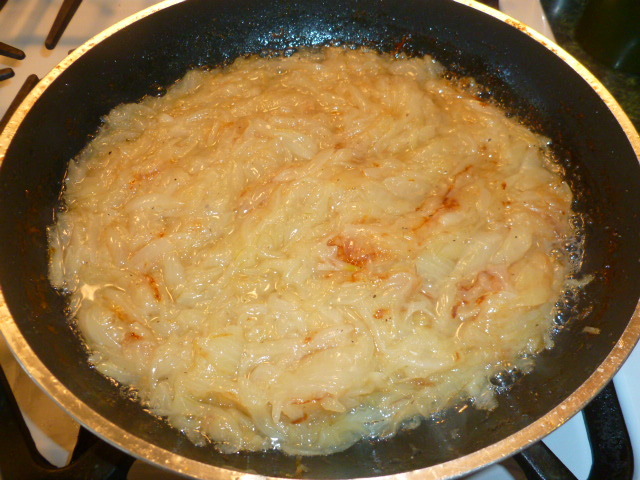 I love caramelized onions. How lovely!